My brothers, sisters, and I try not to be too messy – honest we do! But, with 8 of us in the house, my Lady just can’t seem to get away from cleanin’ up somethin’! Not only does she have to vacuum and dust the whole house EVERYDAY just to contain the fur, but there is also the multitude of accidents happening. If someone ain’t peeing on the floor, then someone is upchuckin’. Then, there are the nasty diarrhea accidents my Lady holds her nose at WOOF! But, hold her nose she does and continues on about cleaning it up with the help of her OdorKlenz products! 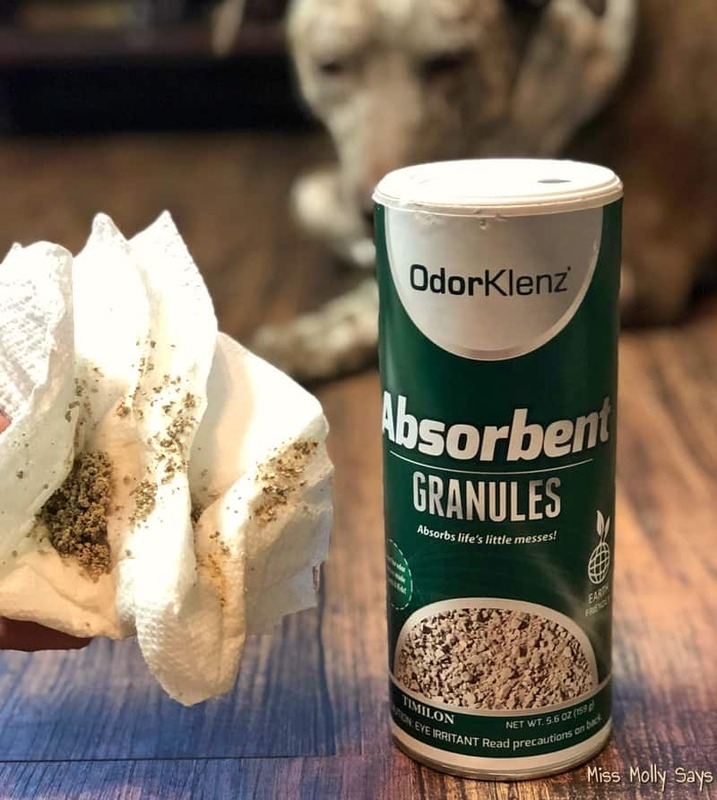 My Lady swears by her OdorKlenz products for making cleanups easy and getting rid of the stink nice and fast WOOF! Now, me bein’ a dog, I have no idea about what makes these products so special but she seems right pleased with em. So, lemme fetch my Lady to tell ya more! When it comes to messes, goodness knows I have my share! With 8 pups underfoot in my home, there is ALWAYS a mess somewhere. From my senior girl and one other having trouble with urinary incontinence to my big Ozzy that likes to eat who knows what on his outside trips, resulting in some ugly vomiting and diarrhea episodes, let’s just say life is never boring here! With all that said, I am very particular about what products I use around my pups! First and foremost, they must be safe and non-toxic! And, of course, they have to work or what’s the use, right? In my search for the latest and best cleaning products for someone with so many messes, I found OdorKlenz and am very pleasantly pleased with the results! Before telling you about the different products, let me introduce you! The OdorKlenz® technology has the ability to capture and destroy chemicals that cause odors. The advanced chemistry behind OdorKlenz is based on the use of safe earth minerals and provides superior odor eliminating results. Their OdorKlenz products do not contain perfumes or fragrances allowing for true odor elimination. 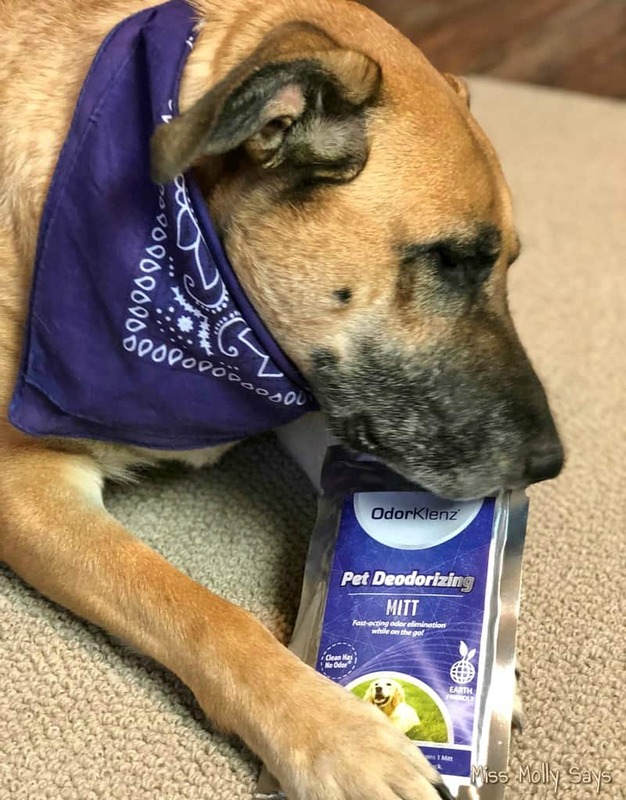 OdorKlenz products are made with a unique and advanced manufacturing process developed to greatly enhance the beneficial odor neutralizing properties of the earth minerals and retain their natural safety characteristics. When OdorKlenz comes into contact with harmful odor causing chemicals, the products capture the bad chemical initiating the neutralization process. OdorKlenz products are made from SAFE earth minerals. They are non-toxic and safe for use around your family and pets. Each of the products utilizes a patented technology that removes odors at the source instead of just masking them. They are also super easy to use! If you have a dog, then you are probably all-too-familiar with their penchant for rolling in the stinkiest of stinky smells! Oh, my goodness! Let them find a dead frog or bird and it is game on! While they think the smell is the best perfume of all, my nose disagrees! And, have you ever noticed that it always happens right after a bath?! Or, what if you have a vet visit and your pet is smelling not so fresh? This is where the OdorKlenz Pet Deodorizing Mitt comes in handy! 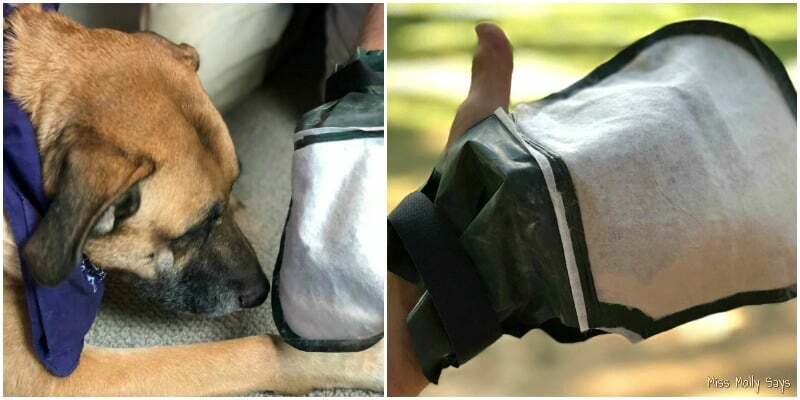 The OdorKlenz Pet Deodorizing Mitt is a lifesaver! The soft mitt contains their patented powder that works fast to ABSORB and NEUTRALIZE odor. It contains nontoxic, fragrance-free, earth minerals to get the job done WITHOUT using harsh chemicals or masking agents! I love the deodorizing mitt because it is convenient to use and helps to prevent the horrid smell from getting on your furniture or in your carpets! Simply slip on your hand with the convenient thumb holes and tighten with the built-in velcro. Then, simply rub your pet down. The pups love it because they think they are just getting an extra petting session! It takes care of the odor quickly and efficiently so you aren’t left smelling not-so-good odors! 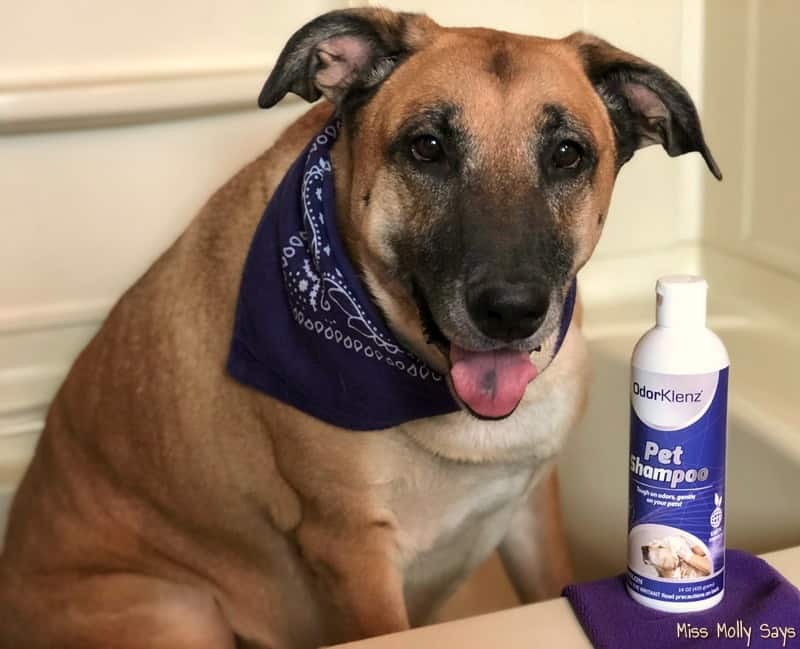 When the pups need a full bath, the OdorKlenz Pet Shampoo is perfect! 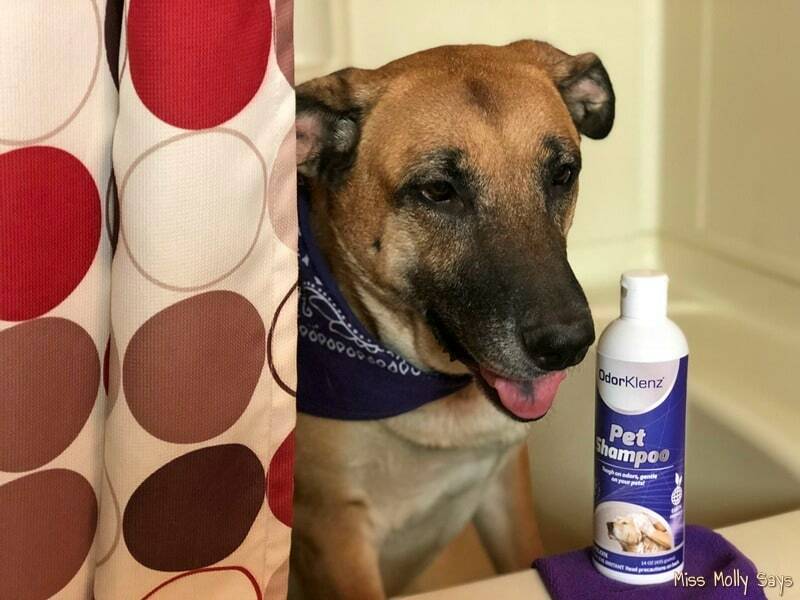 It is even great for pups with sensitive skin and allergies like Brandi and Sallie with skin allergies! 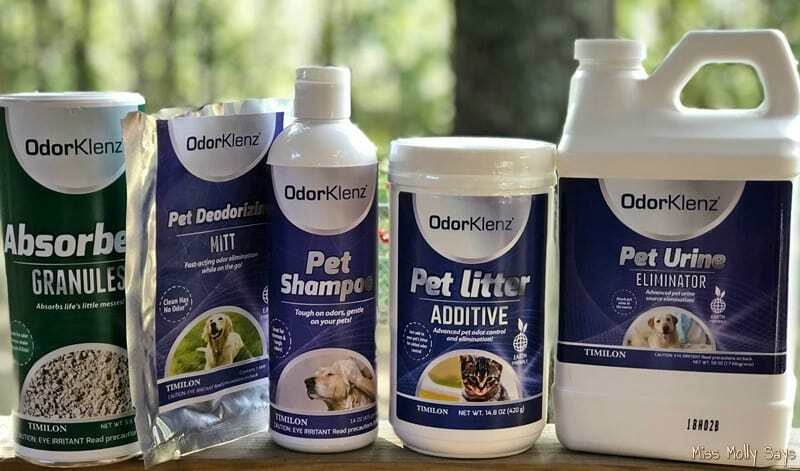 The OdorKlenz Pet Shampoo is non-toxic and fragrance-free. Plus, it eliminates the worst smells like body odor, wet dog, even skunks! It leaves a fresh clean smell behind! 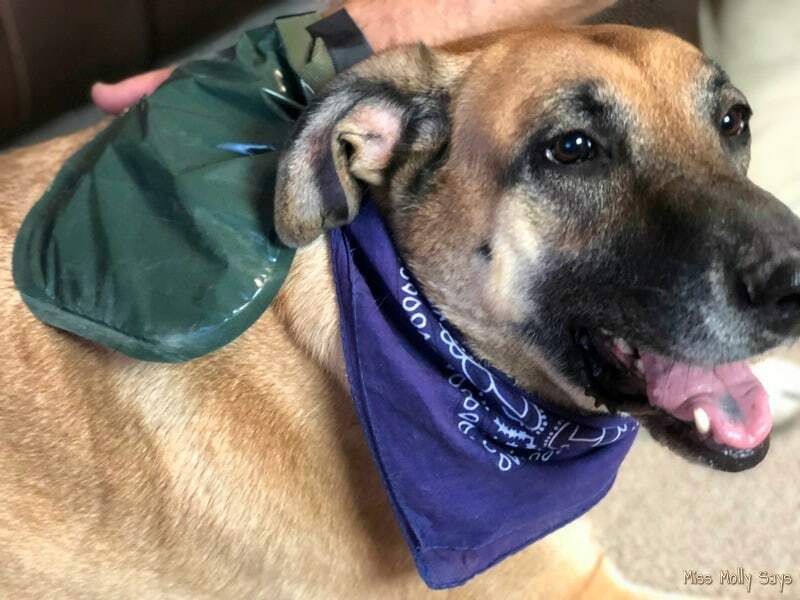 I love that it is fragrance-free because sometimes the flowery smells of other shampoo make the pups a little crazy after their baths – hence the trying to cover it with their favored putrid smell of dead things! As I mentioned above, Ozzy has peculiar eating habits. From dead things to dirt and grass there is nothing out of bounds to him! The same things the other dogs like to roll on, he seems to think they are a delicacy! Go figure! While I try to catch and stop him, I am not always successful and it leads to some horrific slimy vomiting and diarrhea incidents! I am pretty sure you can imagine the picture about now! 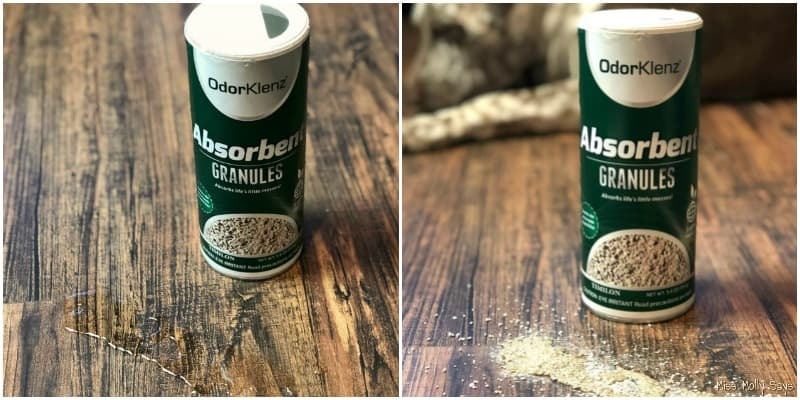 OdorKlenz Absorbent Granules is worth its weight in gold for helping clean up the mess! I won’t subject you to the ‘actual’ vomit and diarrhea images. That may cause you to lose your lunch too – eek! However, I wanted to show you how it works by using a little water. Simply pour the OdorKlenz granules on the liquid mess and it quickly absorbs it making it MUCH easier to clean up. Again, as a pet parent, I am pretty sure you are familiar with the slimy mess I am talking about. Before OdorKlenz, it would take tons of paper towels to get it cleaned up! With OdorKlenz Granules, it turns the slimy mess into a solid so you can quickly scoop it up! Did I say I am in love with this product?! With two dogs suffering from urinary incontinence, there is always a puddle somewhere. Sallie is a senior girl at age 14 and, apparently, it comes with the territory for senior furbabies. While Brandi is only 5-years-old, she suffers from spay-related urinary incontinence. Both of the girls are on medication for their condition, however, accidents still happen FREQUENTLY. Cleanup of the urine and the odor left behind is essential, especially when you have other dogs in the household. Leaving the odor behind can quickly turn into a major issue as all the other dogs will think it is the new ‘bathroom’ spot! 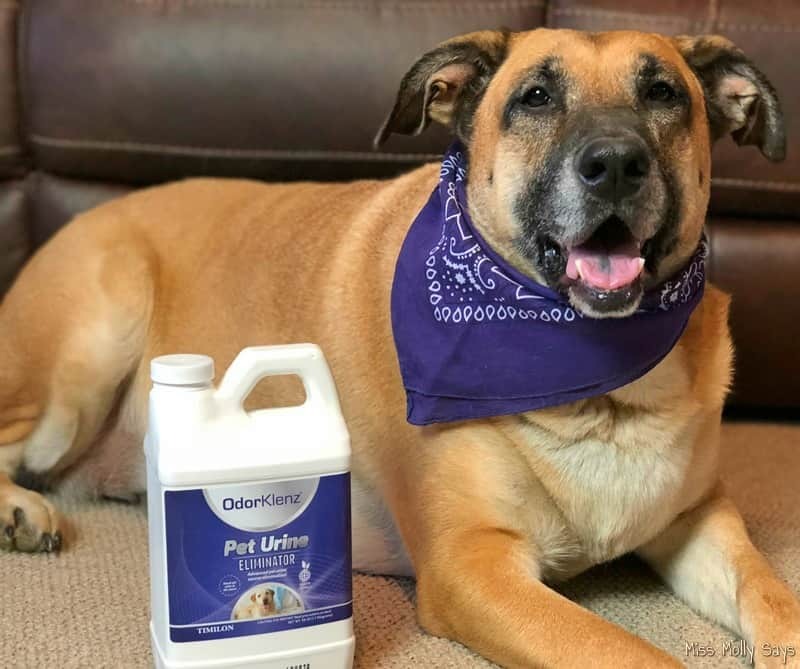 OdorKlenz Pet Urine Eliminator eliminates all types of urine odors without bleaching or staining. It is safe to use around kids and pets, fast-acting, and contains no masking agents or fragrances! It works by neutralizing the odor instead of masking it making it much more effective! Kitties are wonderful pets but I have to admit the litter box smell is something we can all live without, right? Sometimes it doesn’t matter how much you clean it out, the odor remains. This is where the OdorKlenz Pet Litter Additive can save the day! 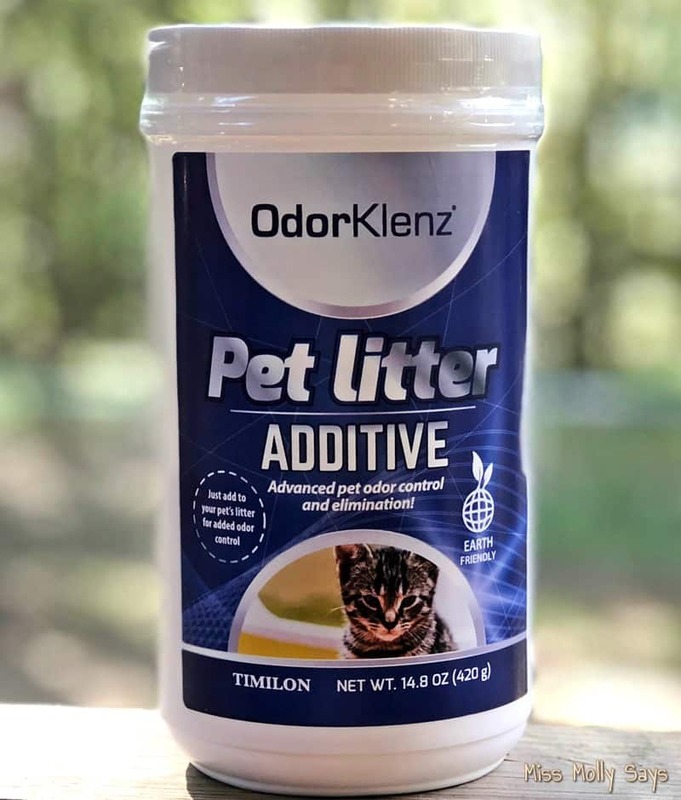 OdorKlenz Pet Litter Additive is a safe and natural way to neutralize those horrific odors! It is super easy to use by simply sprinkling into the litter. That’s it! 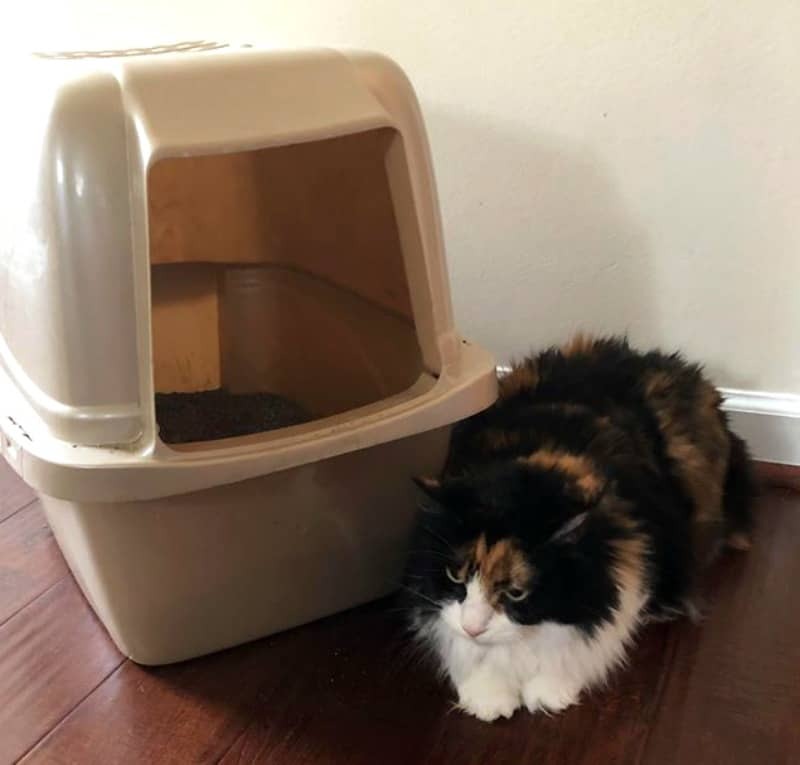 It will keep the litter box clean and odor free. You also don’t have to worry about nasty chemicals because OdorKlenz uses natural earth minerals that are safe to use around your kitty! Just because you have a feline friend in your home doesn’t mean your home has to smell like it! I love the easy to use OdorKlenz products! They not only assist in easy cleanup but get rid of the horrid odors from them. If you have a pet, or multiple pets as I do, then you need to check them out. 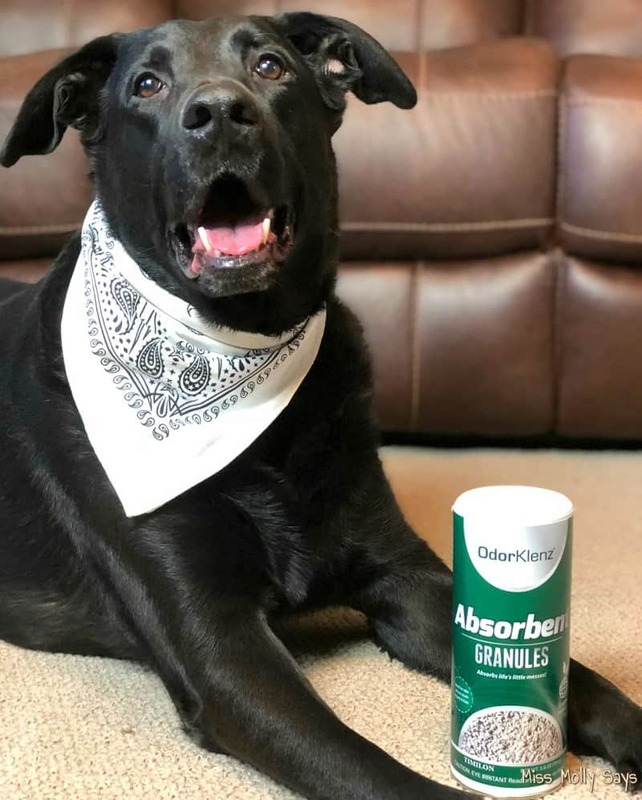 OdorKlenz offers an array of safe products not only for pet odors, but also for laundry, sports, home, and air quality. Visit OdorKlenz to learn more and get yours today for a fresh clean home! These sound like great products! I will have to try some of them. Thanks for the review! I would love to try the litter additive for our cat. These sound like great products. I have 2 cats, a dog and a chinchilla so I need to check them out! I’m so glad I don’t have this problem but at least now I know if I do the product I can take a look at and try. This product does sound wonderful and gets the job done.